This 4mm wide ring has a lightweight, D-shape profile and a depth of 1.3mm. This item is hand-crafted in the UK. See our Engraving page for more information and a little inspiration. Accepted file types: jpg, jpeg, gif, png, pdf, eps, psd, ai. Please be aware all personalised jewellery of prints, engravings, bespoke commissions etc. are made especially to your requirements and therefore, we cannot accept returns unless we have made a mistake with your order (such as a miss-spelling). Sizing rings which have been engraved may have a higher charge to alter or may need to be remade. By ticking the terms and conditions you agree the above information given is correct. This is a lightweight and neat little wedding ring with a D-shape profile. 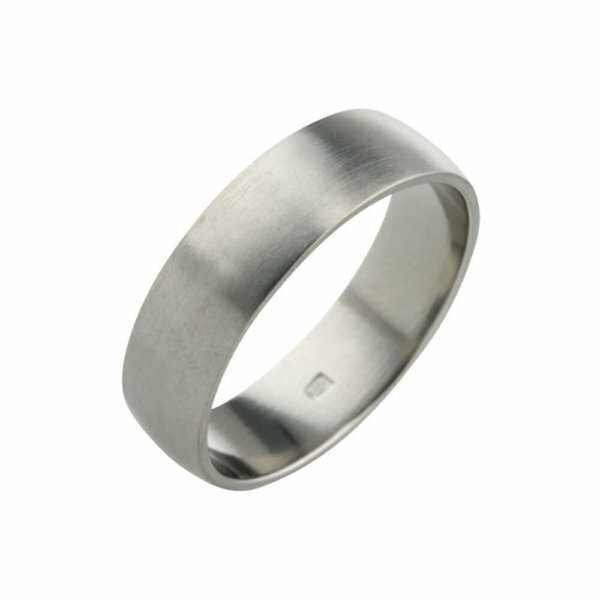 This titanium wedding band is 4mm wide and 1.3mm deep. Choose from a polished or satin finish for your perfect look. Fantastically light, slim and unobtrusive ring I’ll be wearing as my wedding band. I chose polished finish and it’s polished to perfection – Very impressed with the finish, fit and comfort. Thanks! Wow what a ring. Was looking for the perfect lightweight, strong wedding band what could take day to day punishment and wouldn’t be undermined from gym use. A year and a bit later I’m back on the site to make a review because I’m so impressed. Don’t look further just get this one!! Thank you for making a review after a year Ryan. You may cancel your order at any time prior to receiving the item. You have the right to cancel your order within 14 calendar days of receipt of the item and receive a full refund of any money paid. We will not refund your return postage costs and it is your responsibility to ensure that any items returned reach us in the same condition that you received them. If any item is found to be faulty then it must be returned to Prism Design within 14 calendar days of receipt of the item and it will be replaced free of charge. We aim to deliver all items by insured delivery to UK destinations within 7 working days during non-peak times. Deliveries to destinations outside of the UK may take longer. For security purposes, all our deliveries require a signature. Please ensure that the delivery address you provide is secure and that you or someone on your behalf is available to sign for the delivery. Prism Design accepts no responsibility for someone signing for your delivery without your authority. Ti2 Titanium boxes are complementary on all purchases and all items will be securely wrapped for postage. If you would like to alter this design or would like to commission a unique piece of jewellery, please fill in and submit the form below and we'll get back to you to discuss..